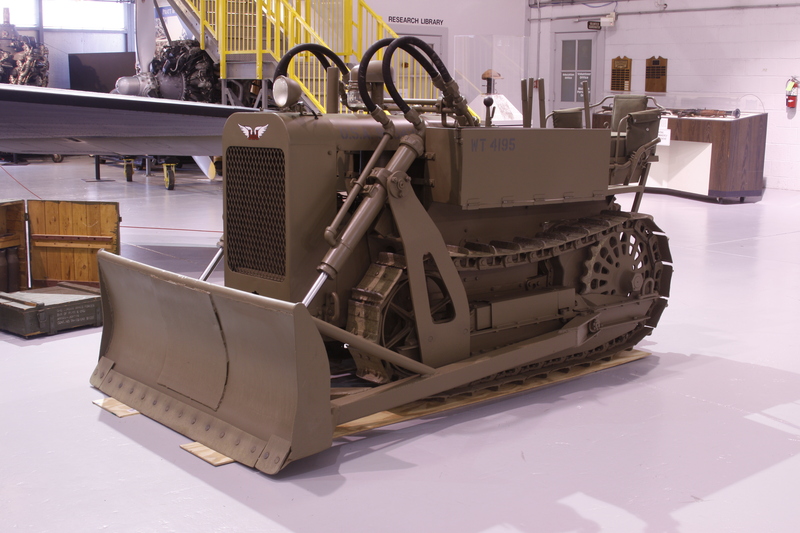 This small tractor was developed for the US Army during World War II to fulfill a requirement for construction equipment that could be transported on a C-47 Skytrain aircraft or a CG-4A glider. Powered by a four-cylinder gasoline engine, the CA-1 tractor has a hydraulically operated 5-foot-wide blade to move earth and a winch to drag equipment into place or to extract itself if it became stuck. Engineers constructed runways, cleared obstacles, and built combat roadways, using CA-1 tractors, specially designed compact rubber-tired tractors, road graders, and pan scrapers. In March 1944, about 30 gliders carrying Clark Airborne dozers, engineers, pack animals, lights and other earth moving equipment landed behind Japanese lines in a jungle clearing in Burma. In less than a day they constructed a runway 300 by 5,000 feet that handled Troop Carrier Command C-47s and gliders to reinforce their position. More than 1,500 CA-1s were used by the US Army. This one was restored by Mr. Darrell Smoker and is fully operational.